Well, this is definitely a post of firsts! This is my first ever successful purchase of a jumpsuit which I am pretty darn ecstatic about and it's also the first time since the start of the year that I have worn my hair down naturally. I'm not going to go into too much detail but I lost a lot of hair at the start of the year (a long, complicated story) and so I've been wearing false hair since then, but I'm now finally getting near a point where I can wear it as is. As I'm utterly in love with this jumpsuit I don't want to dwell on that fact but I thought the sudden hair colour change would inspire a few questions so there you are, but anyway on to the outfit! I've never got along with jumpsuits before, I think a combination of my longish torso and my big bum have meant that I've had real trouble finding one that fit without being too oversized and making me look like I'm wearing a nappy and a baby grow - definitely not a look I have ever been going for. 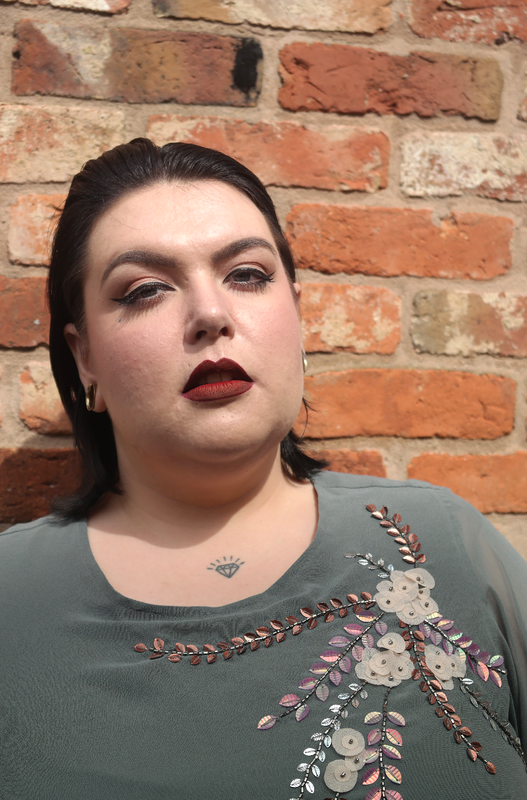 This So Fabulous Embellished Jumpsuit (£82.00) feels like it was made for me however, its wide legs and boxy style top layer that almost makes it look like a co-ord. For me the two main draws of this gorgeous piece were the beautiful grey colour and the bold yet delicate floral sequinning which really has been done so wonderfully. 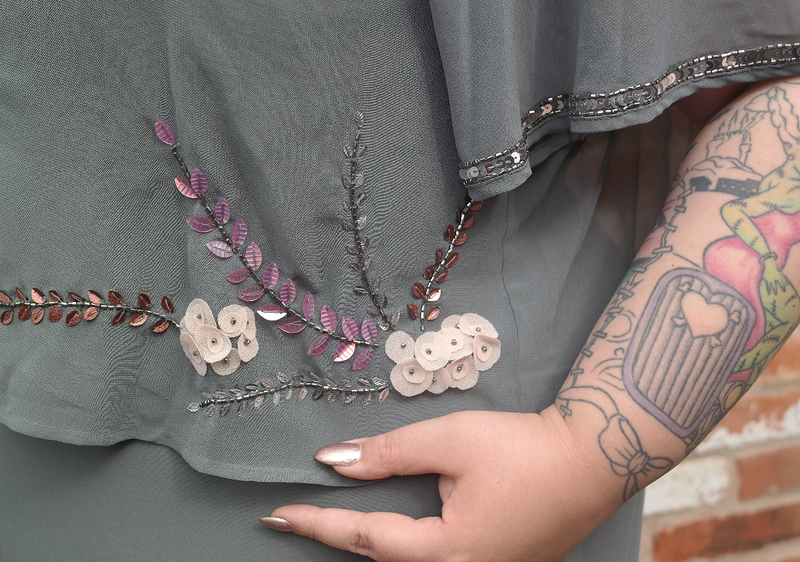 The metallic and pearlescent tones of the embellishments contrast perfectly with their grey background and the placement of them is bang on. The chiffon style fabric is lovely and smooth and the floaty fit to the top and sleeves makes it wonderfully cool and comfortable. The boxy style I feel is also very flattering to most body shapes as it skims over your curves in such a delicate, feminine way. I think this piece is true to size, I ordered the correct size for my bottom half and it seems to me to be just right. 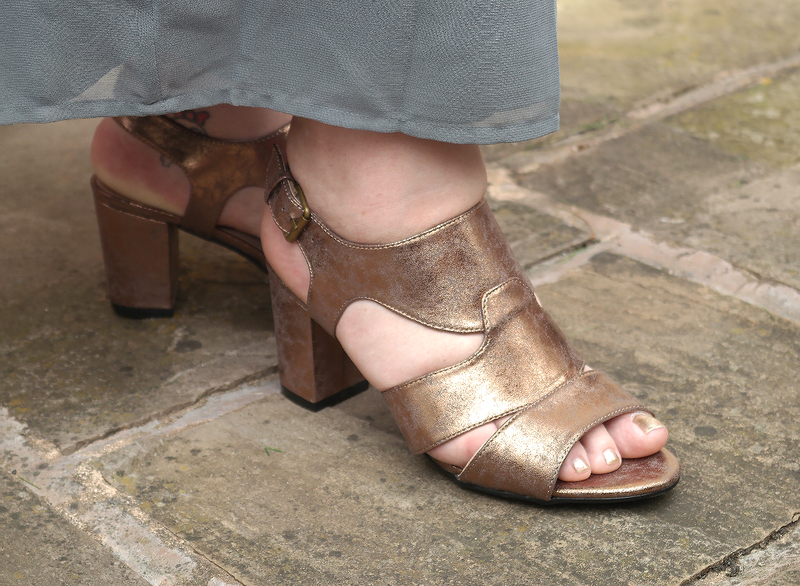 To carry on the metallic detailing I teamed this piece with these Bronze Strap Block Heels from Evans (£36.00) which have to be some of the most comfortable heels I've ever worn. They're a nice wide EEE fit and so they fit my chubby hooves perfectly and they're made from a lovely soft fabric that is kind to your feet and aid their comfort. I predict that I'll be wearing these babies until they fall apart! And this next photo has to be one of my absolute all time favourites. Is it just me or is my little Betty trying to imitate my pose and be a fuzzy little model herself?